The next time you get the urge to reach for a quick snack, try one of these nutritious, easy-to-make options that help refuel yourself without sabotaging your fitness goals. We have picked these choices, such that they use healthy ingredients, involve minimal preparation, can be prepared in a jiffy, and also taste fantabulous. These veg quick snacks will also help achieve the nutritionists' advice to eat small snacks between meals to improve metabolism and keep you satiated till the next meal. Check out the nutritional information at the end of each recipe to make a better choice. Here are some of our healthy snack ideas and how to substitue unhealthy snacks with healthy snacks. 1. 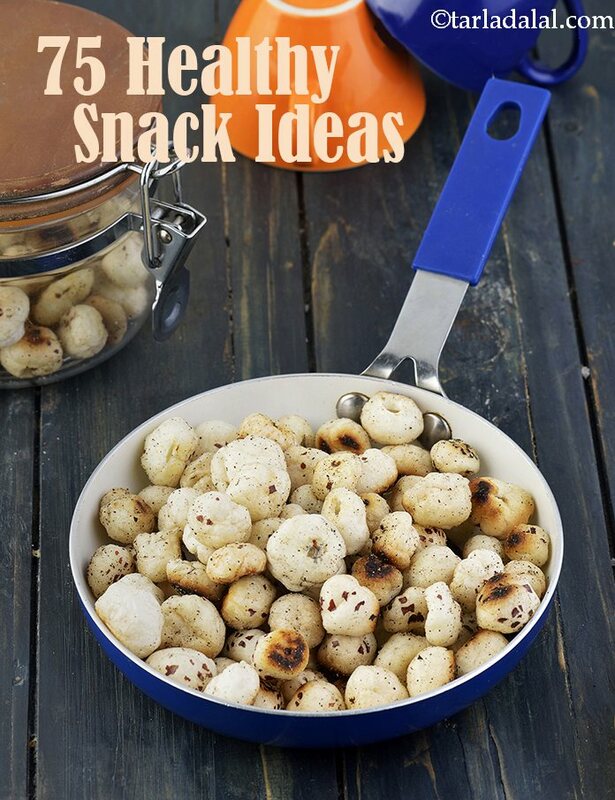 Make Roasted Makhana instead of popcorn. 2. Have Green Peas Waffle instead of Waffles which are maida laden. 4. Mattar Chaat made with baked sev. 5. Cauliflower and Oats Tikki instead of Aloo Tikki. 6. Oats Bhel instead of regular Bhel. 7. Jowar Upma instead of regular Upma. One-dish-suits-all! mint and coriander add an interesting colour and flavour to the crunchy baby corn. Plus, by sautéing instead of deep-frying, we have zapped off the excess calories and pepped up the nutrient-content.